Simon Cowell brought stars like Robbie Williams, The Who, Rita Ora, and Louis Tomlinson together to perform a cover of Simon & Garfunkel's Bridge Over Troubled Water to support the blaze victims' families and survivors of last week's (12Jun17) tragedy. The track sold 170,000 copies in less than 48 hours and had the biggest first day sales of any single released this decade, according to the Official Charts Company. The song also features residents and survivors of the tower block disaster. 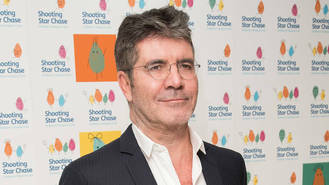 Cowell lives in the same London borough as Grenfell Tower, and quickly called on his famous friends to unite and record a version of the famed former duo's classic. The tune was released on Wednesday (21Jun17), with fans rushing to congratulate Simon for his role in organising the track, from which all proceeds will go to The London Community Foundation. "Downloaded the beautifully done single Bridge over Troubled Water..gave me goosebumps well done to all involved @SimonCowell #GrenfellTower," one person wrote on Twitter. And another added: "Driving to work, and 'Bridge over troubled water' Charity single comes on the radio....wow. #bridgeovertroubledwater #GrenfellTower." The Artists for Grenfell hit has ended Luis Fonsi, Daddy Yankee and Justin Bieber's run at the top of the charts with Despacito, while DJ Khaled, Rihanna & Bryson Tiller's Wild Thoughts debuts at three. Tomlinson's One Direction bandmate Liam Payne's Strip That Down, and French Montana's Unforgettable round out the new top five, while Royal Blood rocketed to the top of the U.K. album chart with their new release How Did We Get So Dark? Other new entries to the top five are Nickelback's Feed The Machine at three and Lorde's Melodrama at five.